We all love living things that glow in the dark, and scientists are no exception. Roger Tsien won a Nobel Prize in 2008 for discovering and developing green fluorescent protein and – perhaps even more excitingly – evil scientists turned mice fluorescent in a recent episode of the BBC television series Sherlock. For animals that live in the blackness of the deep ocean, a little bit of bioluminescence goes a long way. For the squid Euprymna scolopes, this bioluminescence is generated by Vibrio fischeri bacteria that live within its light organ. The light organ is incredible, and it helps to hide the squid’s silhouette. This symbiosis is a win–win situation: the bacteria get housed and fed, and the squid gets a built-in cloaking device. 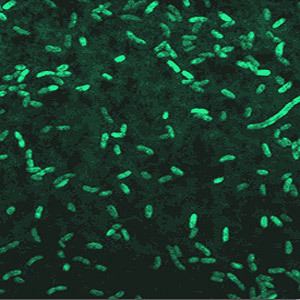 Free-living bacteria also generate bioluminescence – but if they’re not in a symbiotic relationship, why do they bother? Researchers have shown for the first time that the bacteria produce light to attract predators. Although this might seem crazy, it actually provides them with a great method of dispersing themselves throughout the vast oceans, and they might even get some food on the way through their predators’ insides. How clever is that? In a simple experiment, scientists put some zooplankton (tiny animals that eat bacteria) in an aquarium, along with a bag of glowing Photobacterium leiognathi bacteria placed at one end of the tank and a bag of non-glowing P. leiognathi at the other. They found that the zooplankton had moved during the experiment and were found exclusively on the surface of the glowing bag. The scientists also showed that glowing zooplankton are much more likely to be eaten by fish, perhaps because they’re easier to see. Presumably, food is rather scarce in the deep ocean, so eating glowing bacteria – even if it means something bigger might eat you – is worth the risk. Finally, when the researchers analysed poo from both the fish and the zooplankton, they discovered that it contained high numbers of living, glowing bacteria. It turns out that being bioluminescent isn’t just a good way to move around: fish guts might offer a better source of food than seawater. If you’re a bacterium living free in the ocean, getting eaten might not be such a bad thing.